Jon Shook and Vinny Dotolo (Animal, Son of a Gun) are teaming up with Ludo Lefebvre (LudoBites) on a new restaurant called Trois Mec. Look for an April 2013 opening. Trois Mec, 716 N. Highland Ave., Los Angeles, CA 90038, no phone. Casa Martin is now open on Ocean Avenue, in Santa Monica. Expect Mexican favorites including chicken soup with chayote, menudo, steak ranchera tostada salad, stuffed poblano chile, spinach enchilada, pork chile verde, fish tacos and shrimp fajitas. Breakfast, Lunch & Dinner daily. Casa Martin, 1654 Ocean Ave., Santa Monica, CA 90401, 310-663-1732. The former Larchmont Grill has now become The Larchmont. The bungalow-style restaurant offers a seasonal farmer's market Californian menu from consulting chef Don Gragg (Chez Panisse) and executive chef Cody Diegel (Magnolia). Expect duck confit with lentils, braised pork belly with king oyster mushrooms and sherry, chicken "under a brick," and sophisticated salads and sides. The cocktail program comes courtesy of Steve Livigni (Harvard & Stone, La Descarga). The Larchmont, 5750 Melrose Ave., Los Angeles, CA 90038, 323-464-4277. EVELEIGH owner Nick Mathers has opened a new restaurant on West Third Street named Goldie's, in the former Chado Tea House space. Chef Thomas Lim (Duke Bistro, Sydney Australia) serves up breakfast, lunch and dinner, with dishes featuring West Coast shrimp salad; grilled flatbread with crushed peas, smoked fish and oregano; and Boulder Valley beef coulotte with green tomatoes. Lunch & Dinner daily. Goldie's, 842 W. Third St., Los Angeles, CA 90048, 323-677-2470. In Santa Monica, Renee's Courtyard Café has closed and will be remodeled and replaced by an outpost of Jerry Baker's Tinga. Tinga Santa Monica is due to open in April, with Mexican fare and handcrafted cocktails by Joel Black (Comme Ca). Tinga Santa Monica, 522 Wilshire Blvd., Santa Monica, CA 90401, no phone. Restaurateur Jean-Louis De Mori and executive chef Antonio Tommasi are behind Maccheroni Republic in downtown L.A. Tommasi prepares such dishes as fritto di calamari, fettuccine and Venetian duck sauce, and tagliolini with green lentils, spinach and roasted tomatoes (all pastas are homemade). Maccheroni Republic, 332 S. Broadway, Los Angeles, CA 90013, 213-346-9725. The Morrison, a Scottish-themed gastropub, has opened in Los Feliz. Starters include items like Scottish eggs with venison sausage, and scallop salad with brown sugar vinaigrette. Entrées include fish and chips, black pudding, Scottish salmon, and a burger. More than 40 craft beers are on tap. Lunch & Dinner daily. The Morrison, 3179 Los Feliz Blvd., Los Angeles, CA 90039, 323-667-1839. Seasons 52 opened a location in Santa Monica in March. (The first L.A. branch of the national chain Seasons 52 opened in late 2012.) Expect contemporary American dishes like wood-roasted pork tenderloin, mesquite-grilled garlic shrimp and lemongrass king salmon. 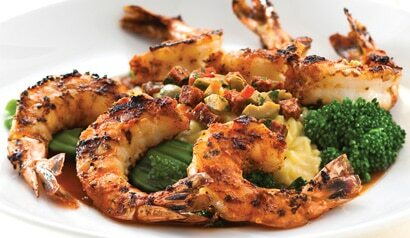 As at the other locations, no dish on the menu exceeds 475 calories. The wine list offers 100 selections, with more than 50 available by the glass. Seasons 52, 1501 Ocean Ave., Santa Monica, CA 90401, 310-451-1152. Innovative Dining Group (Sushi Roku, BOA Steakhouse, Katana, etc.) has partnered with Cecile Tang (Joss Cuisine/Traditional) on Chi Lin. This Chinese restaurant, located in a compact space adjacent to RivaBella, opened May 13, 2013. Chi Lin, 9201 Sunset Blvd., West Hollywood, CA 90069, 310-278-2068. Oprah's former private star-chef Tal Ronnen has opened an upscale vegan restaurant on Melrose named Crossroads, replacing the former Philippe Chow. Expect haute vegan dishes like risotto-stuffed banana peppers; biscuits with morel gravy; kelp caviar; and carrot cake ice cream. Pastry chef Serafina Magnussen (Palate Food + Wine) whips up desserts, and Jeremy Lake (Playa, Rivera) offers an organic cocktail program and a biodynamic wine list. Crossroads, 8284 Melrose Ave., Los Angeles, CA 90048, 323-782-9245. State Social House is replacing Red Rock Eatery and Isla Cantina on the Sunset Strip sometime in May. Expect a global small-plates menu from chef Vernon Cardenas (Matsuhisa, Katana, Pink Taco), specialty cocktails, as well a long draft-beer list. State Social House, 8782 Sunset Blvd., West Hollywood, CA 90069, no phone. Husband-and-wife owners Laski and Laila Abddaim, along with pastry chef Nicolas Rançon, have opened a neighborhood French eatery, the Chaumont Bakery & Café, in Beverly Hills. Baked goods range from croissant and crusty baguettes to chocolate éclairs, tarte Tatin and other fancy creations; a longish lunch menu features a multicultural array of sandwiches, including Scottish smoked salmon, pastrami, and banh mi. Also, expect kale salad, French toast and various organic egg dishes. Breakfast and Lunch, Mon.-Sat. Chaumont Bakery & Café, 143 S Beverly Dr., Beverly Hills, CA 90212, 310-550-5510. The original Katsu-ya, master sushi chef Katsuya Uechi's unpretentious sushi bar concept --- before he joined forces with SBE to create flashier Katsuya restaurants --- is expanding to Northridge. The chef/restaurateur already runs Katsu-ya sushi bars in Studio City and Encino, along with his Kiwami in Studio City and three Izakaya by Katsu-ya around L.A. The new restaurant will take over a space previously occupied by Kabuki. Katsu-ya, 9701 Reseda Blvd., Northridge, CA 91324, no phone. Recently opened in the Valley is Peasant Wine Bistro, where chef Marcel Vinson turns out a farm-to-table menu that includes small plates like cheese and charcuterie boards, deviled eggs with prosciutto di Parma, plus pizzas, pastas and a lamb burger with harissa aioli. An inviting, modern interior includes touches of whimsy and luxury. Dinner Tues.-Sun. 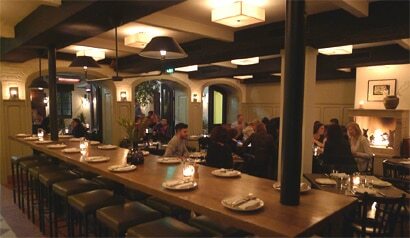 Peasant Wine Bistro, 19100 Ventura Blvd., Tarzana, CA 91356, 818-708-7081. In Monterey Park, a new organic Asian restaurant has opened called Farm Cuisine. Lunch combos are served with fresh organic veggie/fruit smoothies and a soup of the day. There are many vegetarian and gluten-free items on the menu, which also features dumplings, free-range Jidori chicken, grass-fed filet mignon, Singapore curry, and miso-glazed wild salmon. Lunch & Dinner daily. Farm Cuisine, 122 W. Garvey Ave., Monterey Park, CA 91754, 626-280-3276. A second location of downtown L.A.'s iconic seafood restaurant Water Grill will open later this summer in Santa Monica in the Ocean Avenue Seafood space. Water Grill, 1401 Ocean Ave., Santa Monica, CA 90401, no phone. The rustic, Italian Aventine Hollywood has opened near Cahuenga and Selma, featuring a large outdoor patio with olive trees. Chef Adolpho Veronese's Northern Italian menu of pizza, pastas and salads are rounded out with big entrees of whole-grilled branzino, osso buco and grilled rib eye. Aventine Hollywood, 1607 N. Cahuenga Blvd., Los Angeles, CA 90028, 323-500-0969. Rao's, the Italian restaurant with locations in New York and Las Vegas, will open a branch in Hollywood. The menu will offer Rao's classics like meatballs and lemon chicken, plus more contemporary dishes unique to this location. Look for a late spring/early summer 2013 opening. Rao's, 1006 Seward St., Los Angeles, CA 90038, no phone. The former space of The Royceat The Langham Huntington, Pasadena has reopened with a new dining concept. The Royce Wood-Fired Steakhouse features a selection of aged American Prime beef, Australian Wagyu and Japanese Kobe, plus seafood and sides. Chef Anthony Zappola, who was recently chef de cuisine of Craft Los Angeles and Craft in Dallas, oversees the kitchen. The Royce Wood-Fired Steakhouse, The Langham Huntington, Pasadena, 1401 S. Oak Knoll Ave., Pasadena, CA 91106, 626-585-6410. AOC, the popular wine bar owned by acclaimed chef Suzanne Goin and business partner Caroline Styne, has re-opened in its new location in Los Angeles. Expect small plates like pork cheeks with polenta, mustard oil and gremolata, along with "platters" of whole grilled fish with tomato rice, fried egg and crispy sopressata. A.O.C., 8700 W. Third St., Los Angeles, CA 90048, 310-859-9859. Chef Ricardo Zarate (Picca, Mo-Chica) has opened Paiche, a Peruvian izakaya restaurant blending Japanese flavors and Peruvian ingredients, in Marina del Rey. The restaurant takes its name from the Amazonian fish that is featured throughout the menu. Paiche, 13488 Maxella Ave., Marina del Rey, CA 90292, 310-893-6200. Silver Lake's eatery and "community pub," Hyperion Public, dishes up locally sourced contemporary American cuisine paired with craft and local tap beers, wine and cocktails, amid a rustic dining room adorned with reclaimed wood, vintage fixtures and Edison bulbs. Executive chef Paddy Aubrey's menu features fried chicken paired with a spicy blueberry sauce and bacon slaw, a turkey meatloaf with cauliflower purée, a quinoa bean burger and cedar-plank salmon. Lunch & Dinner daily, Brunch Sat.-Sun. Hyperion Public, 2538 Hyperion Ave., Los Angeles, CA 90027, 323-761-6440. Restaurateur Brad Johnson (BLT Steak, Post & Beam) and executive chef Govind Armstrong (Post & Beam) have opened Willie Jane on Abbott Kinney Boulevard. The restaurant is named for Johnson's 100-year-old, Georgia-born aunt, and offers Armstrong's take on southern cuisine with an emphasis on Lowcountry coastal dishes and a selection of large plates served family-style. Bar manager Phuong Tran has created a beverage program that focuses on specialty bourbons and cocktails including seasonal libations and Southern classics. Willie Jane, 1031 Abbott Kinney Blvd., Venice, CA 90291, 310-392-2425. Former Crocker Club owner Vincent Terzian has brought a Parisian-themed, chandelier-laden bistro/bar, Coco Laurent, to Seventh Street in DTLA. Chef Guillaume Jouvet's standards range from French onion soup, beef tartare and salade Nicoise, to fettuccini au pistou, boeuf Bourguignon, lamb burger and steak frites. Expect Champagne cocktails, craft beers, and a select Cal-French-leaning wine list. Weekend brunch features quiche Lorraine and crêpes Suzette. Lunch Mon.-Fri., Dinner nightly, Brunch Sat.-Sun. Coco Laurent, 707 S. Grand Ave., Los Angeles, CA 90017, 213-623-0008. The Black Cat brings American Tavern fare to Silver Lake's Sunset Junction, with former Lou Wine Bar chef D.J. Olsen helming the stoves. Owned by the Village Idiot team, expect a good list of craft beers and handcrafted cocktails, along with a menu that includes dishes like lamb riblets, salt cod fritters, duck leg confit and steak frites. The Black Cat, 3909 W. Sunset Blvd., Los Angeles, CA 90029, 323-661-6369. Ritual Café & Wine Bar has opened at Westfield Topanga Shopping Center, next to Neiman Marcus. The interior is trendy and exotic --- not what you'd expect at a shopping center --- with Asian-inspired design. Dinner is served nightly. Tuna tartare, cheese and charcuterie plates, lobster club sandwiches, salads, and soups are offered, along with craft beers and wine. Ritual Café & Wine Bar, Westfield Topanga Shopping Center, 6600 Topanga Canyon Blvd., Canoga Park, CA 91303, 818-712-0349. The Larder at Tavern is offering take-home menus for Easter brunch and dinner, as well as à la carte options.The complete Easter brunch for eight guests ($215) includes spring quiche, country pork sausage, a breakfast pastry platter and more, while the complete Easter dinner for eight guests ($285) features deviled eggs, Niman Ranch spiral cut ham, strawberry-rhubarb buckle and more. Orders must be placed with 48 hours notice. The last day is to order is March 29, 2013. The Larder at Tavern, 11648 San Vicente Blvd., Los Angeles, CA 90049, 310-806-6460. Chef Jason Travi and littlefork have unveiled a new brunch menu, which includes signature dishes like maple eggs with crispy bacon, a lobster roll with house-made sea salt and vinegar chips, a "good morning" burger with red corn pancakes, linguica sausage, runny egg, and maple syrup, and Nutella-stuffed French toast with hazelnut and banana. Brunch is served on Saturday and Sunday from 11 a.m.-3 p.m., with an à la carte menu and $1 Naked Cowboy oysters and a $5 applewood-smoked Bloody Larry. littlefork, 1600 Wilcox Ave., Los Angeles, CA 90028, 323-465-3675. The Buffalo Club in Santa Monica recently changed its dining format and now offers two different experiences. The sophisticated Iroquois Room features upscale American comfort food along with some French dishes from chef Patrick Healy, while the al fresco Garden Courtyard presents internationally inspired small plates such as oxtail dumplings, Korean BBQ Wagyu short rib, and collards with ham hock jus. The Buffalo Club, 1520 Olympic Blvd., Santa Monica, CA 90404, 310-450-8600. The nominees for the 2013 James Beard Foundation Awards have been announced. Among the Los Angeles representatives are Suzanne Goin (Lucques) and Nancy Silverton (Pizzeria Mozza) for Outstanding Chef, and John Shook and Vinny Dotolo (Animal) for Outstanding Chef West. The annual Awards Ceremony and Gala Reception will take place on May 3 & 6, 2013, at Lincoln Center's Avery Fisher Hall in New York. Find reviews for the restaurants nominated on GAYOT's James Beard Foundation Awards coverage. The Umami Restaurant Group's downtown deli concept, UMAMIcatessen, is hosting a rotating chef series called The Residency. Chef Micah Wexler (formerly of MEZZE) is the first to be featured. He's presenting a $45 prix-fixe menu (additional $22.50 for wine pairings) on Thursday nights through May 16, 2013. Seating at this chef's table is limited. For more information, visit www.umami.com. UMAMIcatessen, 842 S. Broadway, Los Angeles, CA 90014, 213-413-8626. First there was Pizzeria Mozza, then Osteria Mozza, and now chi SPACCA next door to the Osteria. Running the exhibition kitchen is chef Chad Colby, whose charcuterie was showcased at Mozza's Salumi Bar, a limited-edition attraction. In addition to his salumi and terrines, his family-style menu also includes beef-bone marrow pie, Santa Barbara spot prawns, and bistecca Fiorentina. The restaurant offers two seatings for 30 people each night, Monday through Friday, and on Saturday, there is one seating for a nose-to-tail dinner. chi SPACCA, 6610 Melrose Ave., Los Angeles, CA 90038, 323-297-1133. Chef Troy N. Thompson has taken over as executive chef from Guillaume Burlion at Sunset Marquis and The Restaurant. The Restaurant, Sunset Marquis, 1200 N. Alta Loma Rd., West Hollywood, CA 90069, 310-657-1333. Noted Pasadena chef and caterer Claud Beltran, currently at Noir Food & Wine, will be opening Claud & Co., a new bistro on the Crown City's east side, in an unpretentious space previously occupied by Little Britain. An early April opening is expected. Claud & Co., 488 N. Allen Ave., Pasadena, CA 91106, no phone. Mette Williams (Spago Beverly Hills, CUT) has been appointed as the new executive chef of Culina Modern Italian. She has created a variety of new dishes for the menu including zuppetta di cozze with steamed mussels, roasted tomatoes, fennel and charmoula; bruschetta di sarde with marinated sardines, pickled chili and burrata; and ravioli di ricotta e polpa di granchio with ricotta and egg yolk ravioli in a lemon and crab ragu. Culina Modern Italian, Four Seasons Hotel Los Angeles at Beverly Hills, 300 S. Doheny Dr., Los Angeles, CA 90048, 310-860-4000. Chef de cuisine Charles Olalia has been promoted to executive chef at Joachim Splichal's flagship downtown restaurant Patina. He has overseen the kitchen since the departure of former Patina executive chef Tony Esnault. Prior to joining the team at Patina in 2010, Olalia trained with Thomas Keller and Corey Lee at The French Laundry and Guy Savoy at Restaurant Guy Savoy in Las Vegas. Patina, Walt Disney Concert Hall, 141 S. Grand Ave., Los Angeles, CA 90012, 213-972-3331. A rent increase has forced Venice fave Jin Patisserie to leave its Abbot Kinney digs, but owner Kristy Choo is currently looking for a new location. The last day of operation was March 24, 2013. Jin Patiserrie, 1202 Abbot Kinney Blvd., Venice, CA 90291, no phone. Mark Gold's Eva Restaurant has closed. Eva Restaurant, 7458 Beverly Blvd., Los Angeles, CA 90036, no phone. After a brief life of less than a year, Towne Food & Drink has closed downtown; the space will reopen in several months with a new name, new chef and new concept. Towne Food & Drink, Watermarke Tower, 705 W. 9th St., Los Angeles, CA 90015, no phone. On West Third Street, Faux Pas Bistro has closed and will be replaced by an outpost of Jesse Gomez' popular Santa Monica Mexican eatery Mercado. Designer Ana Henton will overhaul the space, and Mercado Santa Monica chef Jose Acevedo is creating the menu. Faux Pas Bistro, 7910 W. 3rd St., Los Angeles, CA 90048, no phone. John Sedlar and Bill Chait's Playa completed its last service March 6, closing March 7, acknowledging that while the restaurant has been critically successful, the concept has not met the "high expectations" they set for it when it opened two years ago. The restaurant will retool and reopen in several weeks with an entirely new concept. Playa, 7360 Beverly Blvd., Los Angeles, CA 90036, no phone.